Am scris pentru Revista 22 un scurt comentariu despre semnificația summitului de la Varșovia. Ultima staţie a turneului european al preşedintelui Obama a fost Varşovia, unde a participat la o reuniune la nivel înalt cu şefii de state din Europa Centrală şi de Est, mai puţin România şi Serbia. 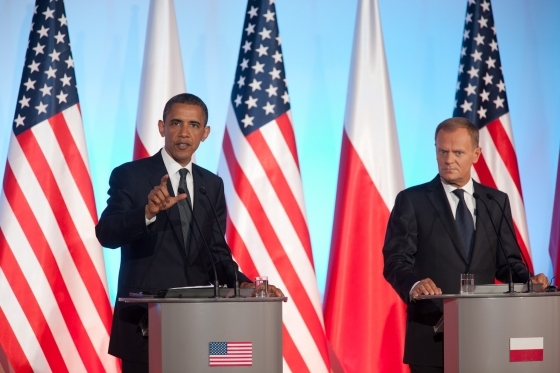 Aici, Obama a semnat o serie de acorduri care consolidează relaţiile dintre SUA şi Polonia. S-a urmărit în principal creşterea interoperabilităţii forţelor aeriene poloneze cu cele americane prin antrenamente şi aplicaţii comune, dar totodată şi demonstrarea seriozităţii angajamentului american faţă de această parte a Europei. În acest sens, atitudinea americană diferă esenţial de cea a altor aliaţi europeni – Franţa a preferat să vândă Rusiei patru nave de desant din clasa Mistral, spre iritarea ţărilor baltice şi a Poloniei. At the behest of my good friend and colleague, Octavian Manea, I am very pleased to re-publish on this blog his posting from Politică Externă. I hope you will find this post as useful and insightful as I did. On October 8th, the Center for European Policy Analysis (a DC think tank dedicated to the study of geopolitical trends in Central Europe) launched a timely sensitive report on the topic of the Hingepoint Allies: Bolstering U.S. Alliances with Exposed States in Central Europe, East Asia and the Middle East. The authors – A. Wess Mitchell, Jakub Grygiel and Robert Kron – highlighted the strategic commonalities and the linkages facing small and mid-sized U.S. allies at global faultlines in Central Europe, East Asia and Middle East. The ongoing shifts in the regional power balances and the strategic choices made by local actors in these new settings point out to a possible medium term trend: ”the subtle but steady unraveling of U.S.-centered security orders at three of the world’s historically most strategically-vital regions”. A group of Central and Eastern European intellectuals and former chiefs of state have published on July 16 an open letter to the President of the United States of America, voicing their concerns regarding the current state of relations between the countries of this region and the United States. The letter comes after the US-Russia summit and is signed by Vaclav Havel, Lech Walesa, Emil Constantinescu, Valdas Adamkus, Martin Butora, Matyas Eorsi, Alexandr Vondra and other important figures who have played a part in the recent history of Central and Eastern Europe. In the letter they emphasize the role played by the United States in Central Europe’s (CEE) transition from authoritarianism to democracy, remind Washington of the contribution made by the countries of this region to the American war effort in Iraq and Afghanistan, while deploring the fact that the CEE is no longer a priority for US foreign policy. The letter criticizes the new “realist” foreign policy of the Obama Administration concerning Europe and Russia, with the shadow of Yalta looming large in the minds of the signatories.